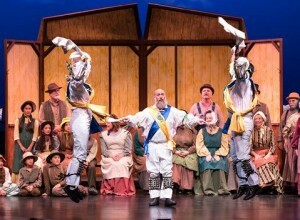 The Christmas Revels at the Lobero Theatre, Saturday, December 20. The Santa Barbara Yule was twice-blessed by the isle of Éire this year. Early in December, UCSB Arts & Lectures hosted traditional Irish-Celtic super group Danú. Coincidentally, Santa Barbara Revels this past weekend set its festivities aboard the S.S. Furnessia making her 1907 sea voyage from Londonderry to Ellis Island during the Christmas holidays. Both shows spread delicacies refreshingly foreign to American holiday sensibilities: the Wexford Carol, rollicking jigs and reels, traditional Celtic dance, and songs in celebration of St. Stephen’s or Wren’s Day—the day of drinking, disguises and revelry on December 26. But here in Santa Barbara revelry saturated the weekend prior to Christmas, thanks to Santa Barbara Revels. At seven years, the local tradition is, by all appearances, soundly rooted and flourishing. Santa Barbara Revels, founded by artistic director Susan Keller, is one in a network of ten companies nationwide that marks significant seasonal changes—especially the winter solstice—with performing arts celebrations of old world traditions. At one level, Revels is a theatrical spectacle with sets, costumes, drama, comedy, song, music and dance. Yet the spirit of the enterprise is community, and that cohesion was in abundant evidence this weekend: performing arts professionals melded with a spectrum of amateurs, volunteers and ultimately the audience. Patrons sang out enthusiastically on Saturday during sing-a-longs, and many brave souls even left their seats to join “The Lord of the Dance,” parading up the aisles hand-in-hand and out to the patio. Much of the fun of Revels has to do with the sheer variety of the spectacle. Live music was the soul of the enterprise with two musical groups providing skilled accompaniment. Traditional string-based music was handled by a sextet—tagged ‘The Kilkenny Coterie’ for the occasion—and directed by tenor and guitarist Adam Phillips. Phillips not only conducted the performance, but as the new Revels Music Director, brought his multiple talents to bear selecting and arranging music—including a wonderful setting of Irish nationalist George William Russell’s “The Voice of the Sea.” A brass quintet dubbed ‘The Belfast Brass Ensemble’ and directed by trumpeter James Watson, rang-out in burnished holiday tones throughout the performance. The crowd showed great enthusiasm for four advanced dancers from Southern California’s Claddagh Dance Company who took the stage several times, skillfully demonstrating footwork-intensive Celtic dance. An annual Revels’ favorite was Santa Barbara’s Pacific Sword Company and their human-living-Mobius dance of mesmerizing twists and crossings. This entry was posted in Reviews, Theater and tagged Adam Phillips, Belfast Brass, Bill Egan, Claddagh Dance Company, George William Russell, Matt Tavianini, Meredith McMinn, Revels, Simon Williams, Susan Keller on December 29, 2014 by joemiller. Happy Few presented by Ratatat Theater Group at Santa Barbara Veterans Memorial Bldg. on Friday, November 8, 2013. This entry was posted in Theater and tagged Casey Caldwell, Happy Few, Henry V, Memorial Day, Ratatat Theater Group, Veterans Day on May 20, 2014 by joemiller.